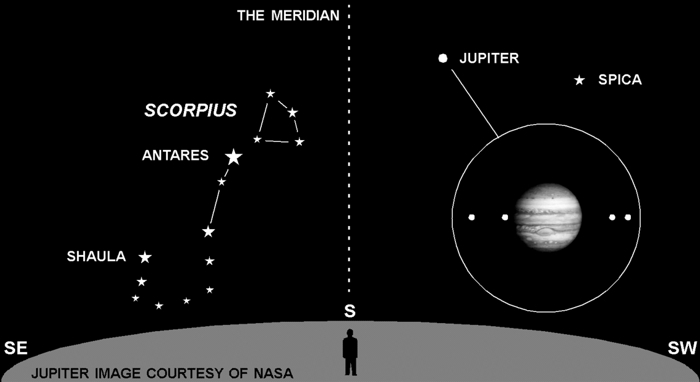 This month is an excellent time to get a look at Jupiter, the “King of Planets.” It will be near the meridian for most of July shortly after sunset. The meridian is an imaginary line running from south to north across the sky. When a celestial object is on the meridian, it’s at its highest point in the sky for that night. Consequently, your view will be less obstructed by haze or light pollution. If you look with binoculars or a telescope, you should be able to see some interesting features on this planet (see inset). The first thing you’ll notice are the distinct parallel bands crossing the disk. These are not surface features. You are looking at the top of Jupiter’s atmosphere. The bands are weather effects similar to Earth’s own clouds and jet streams. The second feature is a line of four moons that bisects the disk of the planet. Sometimes they are all on one side; other times they are split; occasionally one (or more) are behind or in front of the planet. These are the largest moons of Jupiter. You can see them change positions over a period of hours on any given night. Discovered by Galileo in 1610, they are still referred to as the Galilean Satellites.